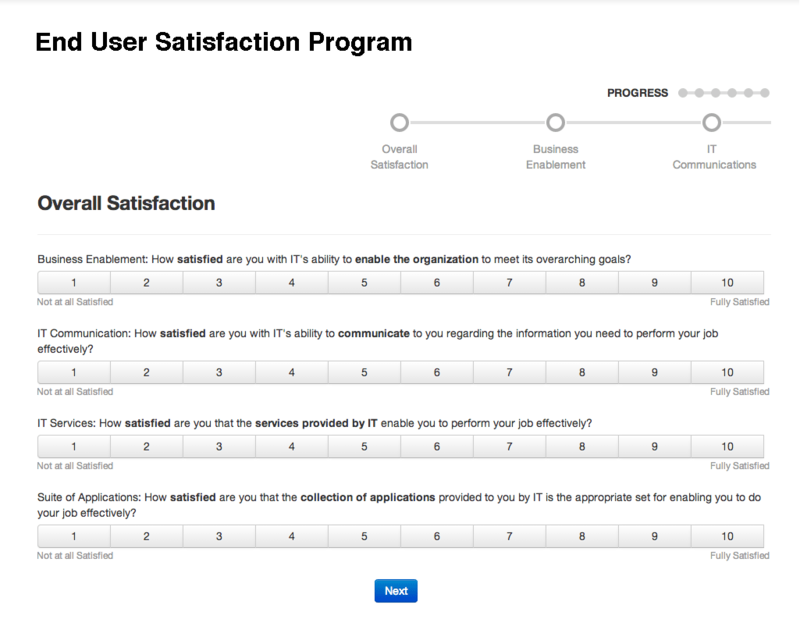 Combine your End User Satisfaction Program with our Application Portfolio Assessment to capture end user sentiment on both satisfaction and your suite of applications. Info-Tech’s End User Satisfaction Program has been designed to be applicable to your organization, no matter your size or industry. Download a preview of the report to see the value that it can bring to your organization. View a sample of the short 13-question diagnostic. This simple-to-deploy questionnaire is designed to be quick and user friendly for end users, and deliver valuable insights for informed IT decisions. Get started now! Prepare for launch with this template. The misalignment of hierarchy labels between our countries was a bit of a complication. Trinity Valley Community College Inc.
Great summary. Wish my most concerning topic, IR Mgmt., had more templates to better operationalize the concepts. I understand this will be available in 2015, so I may just be a bit early. I look forward to other resources Info-Tech could suggest. Time - If this is based on just the Scorecard, then I think it would have taken me about a week to research all of it. But without actually doing the research, that is just a guess. Quality - Again, just based on the Scorecard (and not the information that is going to be forwarded to me afterwards), the Scorecard seems to just be graphs from the survey answers. What I am mostly looking forward to is the information that the Info-Tech employee is going to be forwarding me. Scorecard score - 5/6. What I hope to get out of everything in the long run - 9/10. Dollars - Without researching this and getting quotes, I have no idea what this would be. Best: Presentation of the survey results by Mr. Michel Hebert. Worst: There were times when the diagnostic team was not as responsive as I would like. What worked: Overall, it's great to have our customers' opinions and perceptions documented. Themes came out that we can now address directly. The free-form feedback was invaluable. Lessons learned: Knowing what I know now, I would have liked to see a mock survey result document to better understand how the results would be presented. I think it could have helped me with my ?dept. name? problem and also would have helped to visualize how the questions would be represented back to me. I'd say the hardest part about this was just getting the ball rolling (mostly resides with me on that). The best part was Yussra. Helpful insights to guide our strategic response to last year's survey as well as prepare for next year's survey. The whole experience was very professional especially the survey feedback. It was a pleasure to work with Yussra. She is professional and timely. The results will be very useful, especially the benchmarking since this is the first time we've done this with your company. The review of the results was useful as it was coming from a disinterested third party. The only negative is the inability of this survey process to support Canada's two official languages. Yussra and Michel were both helpful in assisting us with assembling and interpreting the results of the user satisfaction survey. Apart from a lack of needed "Not Applicable" answers as part of the survey questions themselves, I am very pleased with the results. I should note that the level of effort required to adapt the survey questions for our local context required more effort on our part than I originally anticipated, but it was well worth it. Best: Being able to get the amount of data so quickly. No worst aspects. Best. Good analysis, quick to implement, good report, and easy to interpret. Worst. Lack of Spanish so comments could be read and pondered into the analysis. Standardized format, benchmarked data, and great service and communication throughout the program. Looking forward to next year! Best: Ease of administration, quick turnaround. Worst: Lack of consistency from year-to-year in a survey we've now completed 4 times. It was all a good experience. I love the report and the way it's prepared. The survey was really helpful in seeing where we need to improve. Great insight into how we're doing and what our customers think. Several users were not able to proceed with the survey because they felt the survey "locked up." In reality, they did not see the error message at the top of the page because they had scrolled down the page to complete the questions. Changing the order of the questions would have allowed them to see the error message when they tried to proceed. The best part is that I received excellent, accurate data. The worst part is that I had to constantly campaign to get people to fill out the survey; but that is probably unavoidable. Best was the ability to measure against other companies. Best: Having the discussion with Michel Hébert on the survey results, and in particular how our results benchmark with others. Michel's insights have confirmed my thinking and direction, and add weight to my arguments going forward. Thank you Michel. Eric and Michel were very responsive and easy to work with. The analytics provided were excellent. Using Info-Tech to conduct our survey was a very positive experience. I appreciate everyone's help. I look forward to receiving the benchmark data. Best: Access to experts and helpful insight from experts; Worst: Not the worst, but there should be an easier ability to customize survey questions. It was all good but it would have been better had we better understood how to explain what was anonymous. We did get it explained and understood, but by not explaining it right the first time, it delayed some respondents filling out the survey.